This is an easy and delicious appetizer you can make in minutes. Try using Lykovouno Olive Oil for enhanced flavor. Serves four. 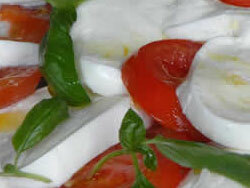 Thinly slice tomato and mozzarella balls. Set aside. Place an array of tomato slices on a serving plate. Cover each slice with a slice of mozzarella. Drizzle oil over the cheese and sprinkle with dried oregano, salt and pepper. Garnish with basil leaves and serve.